Team Trini, Kevin Ousmas, Christian Ali, Benjamin Rondel and Mathieu Leroux after a satisfying morning static sesh. The flavors of Trinidad are undoubtedly garlic, shadow benny (Trinidadian cilantro) and pimento pepper. Almost every dish I’ve ever had at Mustaq Mohammed’s house, which is many, include some variation of these three ingredients. These are used to enhance the freshest foods such as fish just caught by our host and his eighteen year old son, Saif, or rabbit from his private backyard supply (Vintage: right now baby!). Swimming in the Mohammed’s backyard pool while he concocts an exquisitely colorful array of food for us, I wonder why he doesn’t open a restaurant. I’ve only eaten one other place in Trinidad where I actually crave the food. A local choka restaurant serves simple and delicious fare. Plus, what’s better than eating with your hands? But seriously, why doesn’t the guy open a restaurant and give everyone a chance to explore real Trini food? They are the most tenacious group of divers on the planet. The real flavor I want to mention is not the food, although I just remembered I’m hungry, but the freedivers in Trinidad. We teach one or two courses per year in Trinidad and have been for the past several years. The courses are always full and I’ve noticed a trend when it comes to the divers. Despite their experience level (some are expert spearos, some are learning to swim with mask and snorkel) they all have one thing in common-besides the name Mohammed. They are the most tenacious group of divers on the planet. This is saying a lot when you consider that we are always in the water and regularly dive with people obsessed with the ocean. The people we dive with are usually doing it for a living or are competitive freedivers (the two are NOT the same although I wish we could make a living diving competitively). The Trinidadians rank right up there with the dive consumed we are used to. They are happy to be in the water seven days a week regretting there is not an eighth day on which to dive. Compared to the Trinis and their tenacity in the water, Ren and I are weak! 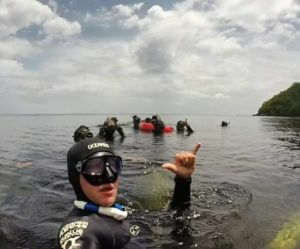 Ren sporting the shaka during a line diving session near a place called Chaguaramas. We always have this small but deep bay to ourselves. These guys are happy to dive anytime in black water. Sure the water in Trinidad clears up into a nice green hue…sometimes. But every time we’ve taught there it has been some of the darkest water we’ve encountered even compared to eighty meters plus in a limestone sink hole where there is zero light. These guys don’t just dive in the murky darkness because they have to. Crystal clear Tobago is only around sixty-four or so miles to the northeast of Trinidad. They dive because they love it. 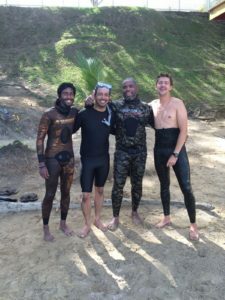 Their love for it is evidenced by their willingness to take a freediving course, buy new equipment, show up on time (island time actually) and completely engage. The students ask questions constantly and take notes. Sometimes I even understand the questions through their thick island accent. Despite the fact that English is the official language there are still major language barriers at times. Although there are equalization issues, technique issues and a lot of anxiety issues the Trinidadians suit up and try hard. This is more than I can say for Ren and myself who have been spoiled by perfect waters. I’m not sure we would dive like we do if it wasn’t in “perfect conditions”. This realization makes me sad because I remember diving in dark water, cold water, whatever water we could find. We aren’t like that anymore. We love diving but have lost the pure love and excitement of diving in any conditions just to be in the water. These guys remind me of that. 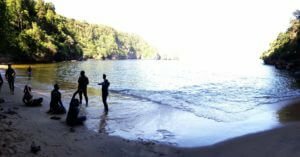 Macqueripe Bay is a prime location for statics, safety practice and entries. It’s calm, green and shanked by lucious jungle. I always leave Trinidad looking forward to our return. In part to eat Mustaq’s food, in part because his daughter, Samiyah and our daughter, Ani are exactly the same age and love playing together. But mostly for dark diving with some of the most dedicated divers on Earth. I’m looking forward to the first Trinidadian interested in competition diving. Who wants to set the first national records (Saif, Kenronishe, anyone…)? The flavors of Trinidad are delightful!